Try to use lame-duck session to reschedule the state Supreme Court election in 2020. 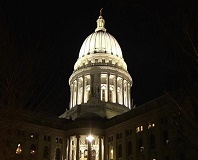 MADISON - The following is a statement from Democratic Party of Wisconsin chair Martha Laning on news that legislative Republicans are considering passing legislation during their lame-duck session to reschedule the state Supreme Court election in 2020. This move would benefit future conservative candidates and potentially cost Wisconsin taxpayers millions of dollars. "Robin Vos and Scott Fitzgerald want to put their thumbs on the scale and manipulate an election that won't happen for over a year. This is exactly the kind of calculating, divide-and-conquer politics Wisconsinites voted out last week. Vos and Fitzgerald would be wise to listen to the will of the people and respect our system of checks and balances."